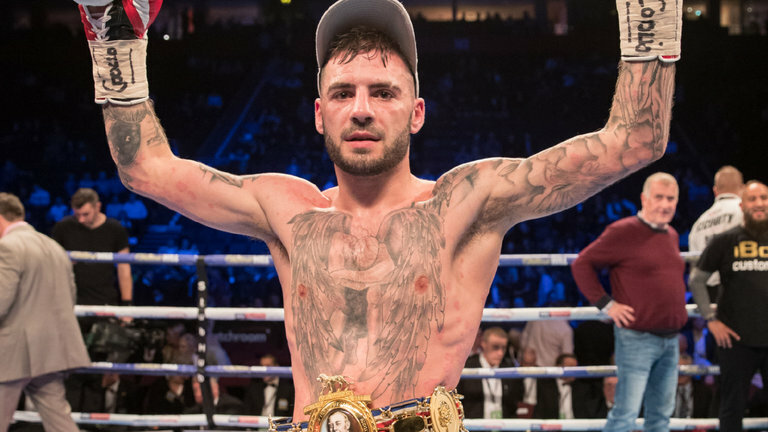 Lewis Ritson will defend his British Lightweight title against Scotty Cardle at The O2 in London on March 24, live on Sky Sports. Ritson put in a stunning performance in his first defence at the end of February, destroying Joe Murray in the first round in Manchester to move to 14-0 with an eighth stoppage. The ‘Sandman’ was back in the city he landed the title in October, stopping Robbie Barrett in the seventh round to claim the Lord Lonsdale belt. Barrett had ripped that title from Cardle in Glasgow in April, handing the Lytham St Annes man his first pro defeat, but this shot at Ritson offers the 28 year old a chance to reclaim the prestigious title for keeps and get back into contention for more major honours. “I’ve made a couple of statements now by beating Barrett and then Murray – and I want to do it again against Cardle,” said Ritson. “We wanted the Cardle fight in Manchester but he pulled out. Scotty wants the title back and he’s in a similar position to Joe Murray was where he really needs to win the fight but if he gets beat, where does he go? So that should make it a really good fight. “Domestic level could be described as European level really as the lads at Lightweight like Scotty and Sean Dodd are top fighters. “I’ve sparred with all the top names like Ricky Burns, Anthony Crolla, Kiryl Relikh and of course Cardle – so boxing people know what I can do and now that I’m with Eddie and Matchroom on Sky Sports, the public are getting to see what I can do too. “Lewis showed against Murray what he can do,” said Cardle. “He’s a deserved British champion but obviously I believe that he’s just holding that belt for me to take it from him. He’s an honourable guy so hats off to him for fighting me next, anyone that knows me knows that I didn’t show up against Barrett in Glasgow, what he did to Robbie is what I could’ve done, but I wasn’t myself that night. No excuses – I wasn’t good enough. “I’ve had a six rounder since that fight but this is the one I want. I need to get that title back and show that I am the best in Britain. Ritson and Cardle clash on a huge night of action in Greenwich as Dillian Whyte and Lucas Browne meet for Whyte’s WBC Silver Heavyweight title in a crucial clash for the division while Frank Buglioni defends his British Light-Heavyweight title against Callum Johnson. Face value tickets for March 24 are available from http://www.stubhub.co.uk/matchroom-boxing-tickets/ . StubHub is the official ticket partner and marketplace of Matchroom Boxing and Anthony Joshua.